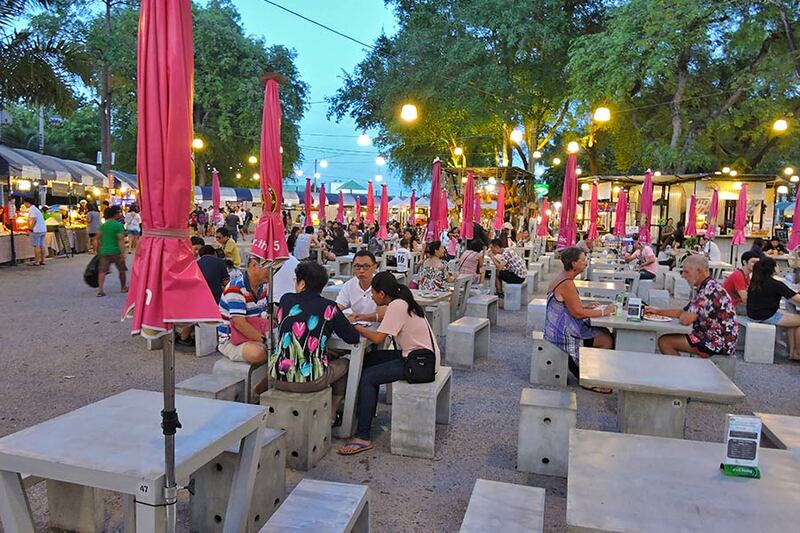 Cicada Market is rated the #1 ‘thing to do’ in Hua Hin by Trip Advisor, so for visitors to Hua Hin, this is a must do. Tamarind Market is just a stone’s throw away, so let’s compare the two to help you decide your preference. 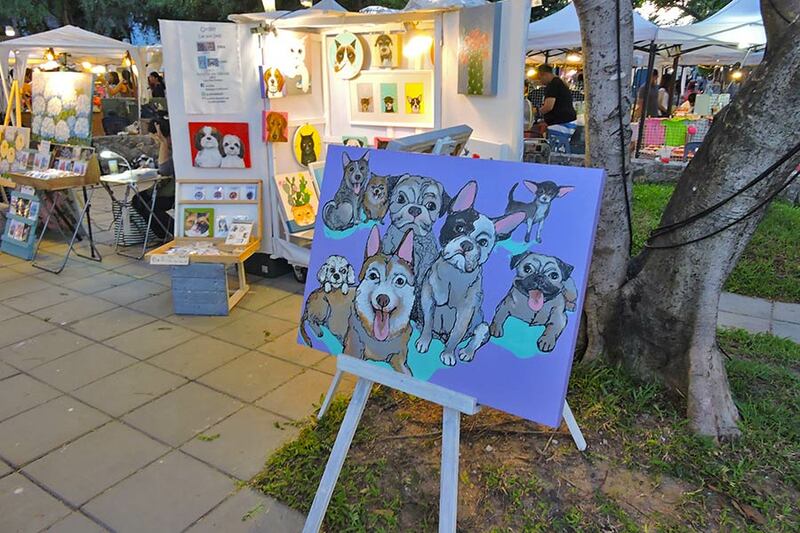 Let’s start with Cicada Market, which is divided into four venues: Art A La Mode, Cicada Art Factory, Cicada Cuisine and the Amphitheatre. From buskers as you enter, to a large variety of food and drink options, or step it up and take in a live band or maybe a theatre performance at the Amphitheatre; Cicada has it all. Some of the other attractions here are the vast array of unique art & craft vendors as well as one-off clothing stands that are a joy to wander through at Art La Mode. The two white buildings at the centre of the market are Cicada Art Factory. These serve as a venue for art exhibitions featuring young, original local artists, as well as those from further afield. It regularly features artworks as diverse as illustrations, portraits, paintings, photos and sculptures. This adds such a cultural element to Cicada. 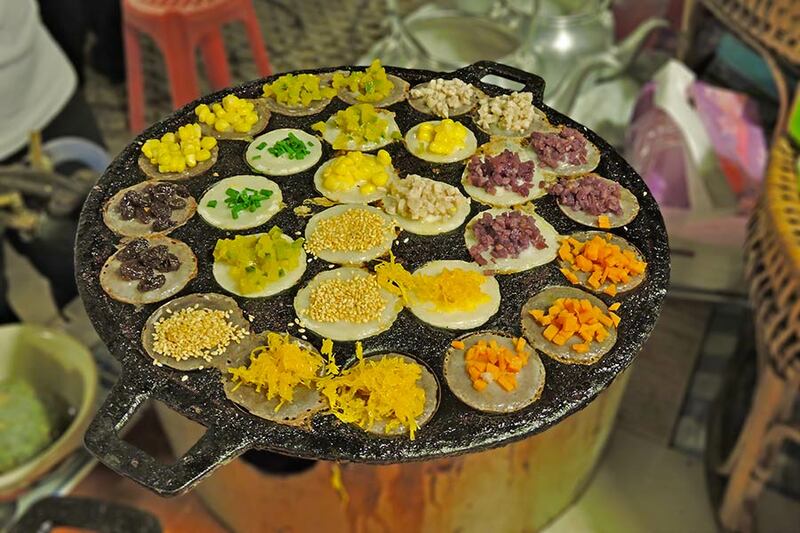 Situated in a circle in the middle of the market, Cicada Cuisine guarantees you’re never far from a food vendor preparing something delicious. With seating no issue, finding a table is easy. There is everything from Street Food to sweets and international food options, with everything cooked freshly in front of you. Collect your coupons and away you go. Everything is clearly priced so you can simply point and pay! The little brother of Cicada is Tamarind Market, so named due to the Tamarind trees lining the small park. At the front along the main road, you will find a retro, laid-back feel to both the eating and entertainment area, though most people tend to enter either from Cicada at the side, or from the car park at the rear; walking firstly into an extremely local version of a market, with food and clothing, plus other surprising things to spend your baht on. This is not an official part of Tamarind, though their name in Thai is Dta-Laat Ma-Khaam or Tamarind Market. The first thing you notice about the real Tamarind Market is the layout of the food stalls, before hearing the sounds of the local band playing in the corner. Here you will find traditional Thai fare on offer along with many international favourites like pizza, American-style ribs, pasta and Sushi. There is less selection than at Cicada, but the ease of discovery is better. Local vendors are upbeat in acknowledging you and enticing you to sample what it is they are cooking. Many are great performers, posing for shots from a distance. 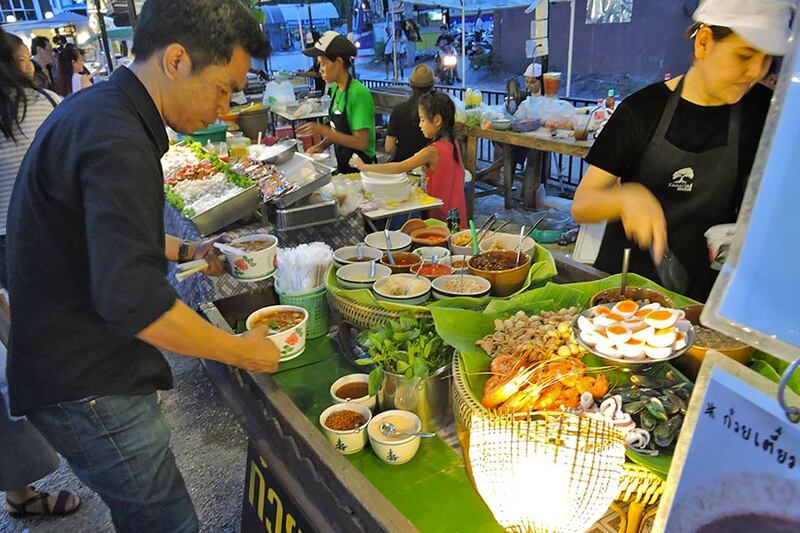 If you do happen to venture into the super local part of Tamarind, you’ll discover it is primarily about Thai food at extremely cheap prices. Yes, you will have to search out the food you want to sample, but there are tables and seating provided. Though not as glamorous its namesake, or Cicada, it is simply good, honest Thai food. 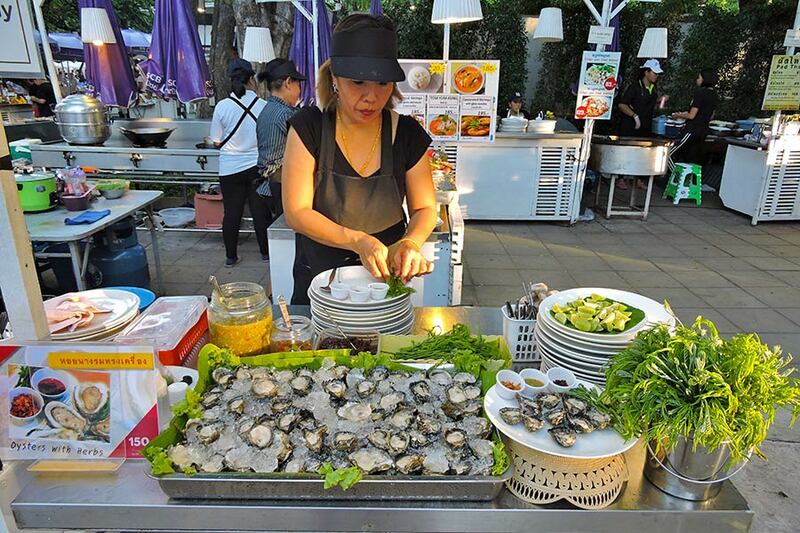 Cicada: Set up for everyone, be it the first time visitor to Thailand wanting to experience quality street food, or the experienced traveller after something more adventurous. It is also very family-friendly. It has plenty of food options and wandering through the art & craft stalls and art exhibitions is an amazing experience, as is the fabulous amphitheatre. Tamarind: The front section is for the person wanting a more laid back, intimate dining experience, though also set up for families to enjoy. What is good is that you can enjoy the band from the table where you are eating. At the back of Tamarind is the super local market, which is for the experienced traveller who wants more local flavours and price. It’s no frills, but has a decent selection of local food favourites. 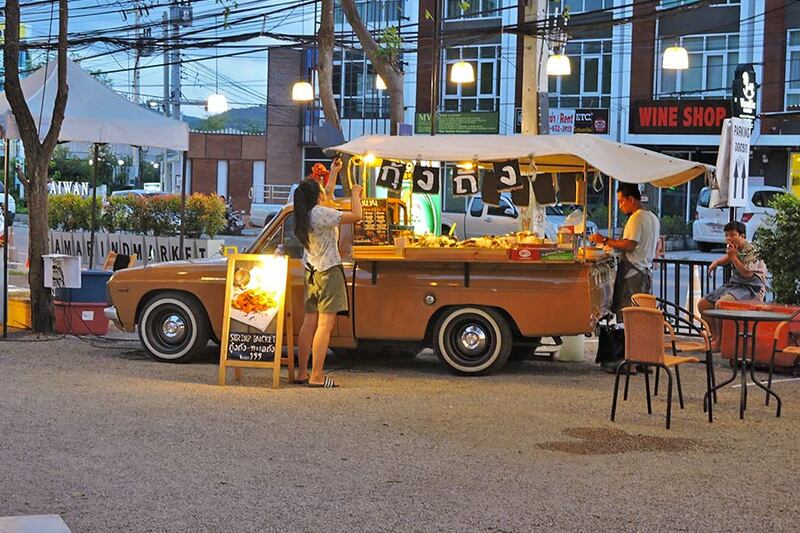 Both markets have a lot to offer travellers to Hua Hin. Pick which side you wish to experience and discover; or maybe split your time between both markets! You won’t be disappointed. If driving, there is parking either across the main road from the entrance to Cicada or behind Tamarind. The local Green Songthaews run both ways right past both markets and there are always Tuk Tuks waiting to take you away. Great place to spend a Saturday evening, good selection of food, interesting local craft stalls a very good family atmosphere. Always on my list of things to do when I go to Hua Hin! You bet Scottie. The food is top quality, as is the location. It all looks good to me ?? ?